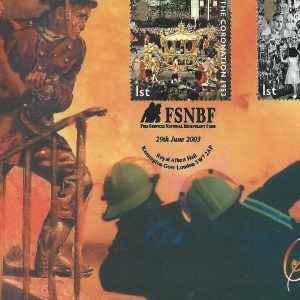 Bletchley Park Post Office cover titled Fire and Water FDC 072 depicting the Firefighters Memorial and St Pauls Cathedral. This cover is part of a limited edition of 1,000 covers issued by Bletchley Park Post Office, 16th September 2003. Fire and Water on Official Bletchley Park FDC with London’s Fire Brigade. This is a limited edition cover and part of a wider collection of covers (1,000 in total).